Gary Blount, psychiatrist-turned-producer, has created a remarkable new film about the last days of Dietrich Bonhoeffer in a Nazi concentration camp, told through the eyes of a British broadcast team. Question: You have just produced a film about influential theologian and anti-Nazi dissident Dietrich Bonhoeffer after years of studying his work. What has kept you so interested in Bonhoeffer? As with all of my heroes, I’ve constantly tried in one way or another to relate to Bonhoeffer, and I suppose this has gotten a bit easier as I’ve become acquainted with a few members of his family in Germany and England. From the beginning, I’ve loved his hard-core faith and courage, but I confess I’ve also been increasingly wowed by his good taste: Bechstein piano, Audi (okay DKW), and pet Saint Bernard. And it was easy to relate to his need to move back in with his parents and his willingness to accept an adult allowance. Dare I mention his eagerness to marry a girl half his age who was possibly smarter than he was and a lot better looking? You work as a psychiatrist in Minnesota. Do you have a particular interest in theology? Does your expertise in psychiatry give you particular insights into Bonhoeffer and his still-discussed ideas? It seems to me there is a kinship between theology and psychiatry. Many people seem convinced that neither one requires a degree or even specialized study. Seriously, I love theological insights and, in fact, really look forward to hearing them occasionally from the pulpit. You know, Bonhoeffer said some harsh things about mental health treatment, but some of his actions in prison reveal a more open stance. For instance, recently I read that when he would learn from a fellow inmate in Tegel that a family member might benefit from a psychiatric consultation either to address a condition or simply mitigate what otherwise might seem to be a hopeless forensic situation, Bonhoeffer would find a way to refer the person to his father, the recently retired psychiatrist Karl Bonhoeffer. I would put that in the practical theology column. I recall a legendary professor of medicine at the University of Minnesota who would tell his residents and students: “With this new patient, I don’t care who does the physical exam; I’ll do the history.” That’s what I want to continue doing — focus on the dynamic story. What is your film Come Before Winter about? Our story is about the final chapter in Dietrich Bonhoeffer’s life and what must have been the aching for deliverance by the Allies, who were rapidly closing in. We felt our time frame might extract something of the essence of his life and the perspective which he seemed to seek — “the view from below.” This view now includes more uncertainty, wartime cruelty, and vengeance. Bonhoeffer had long been an outspoken foe of Hitler, and we chose to tell the story with the help of a couple of other anti-Nazis: seriously broken vessels Sefton Delmer and Otto John. The latter has been called “the living link” between Bonhoeffer’s last days and the storyteller in England. Is the film more focused on the events of Bonhoeffer's life and his work in trying to bring down Adolf Hitler, ending with his execution in a camp, rather than his theology and his ideas? The short answer is yes. We wanted to travel with Bonhoeffer the last miles in the company of his fellow prisoners. As much as possible, we wanted to rely on the people who were there and took notes, you might say. Most of them survived the war as did many in Bonhoeffer’s family, though they were deeply implicated in opposition to the regime. For instance, Dietrich’s best friend drove Karl Bonhoeffer’s Mercedes carrying the bomb to the train which would transport it to Hitler’s plane. We sought to embed Dietrich Bonhoeffer in the German resistance, at first ridiculed abroad and reviled at home. In true affection for a hero, I think most of us would want him or her to make it — and Dietrich Bonhoeffer came close. How close? I’d been skeptical of the standard answer which was that on April 9 the Allies were within 50 miles of Flossenbürg. For an answer I prefer, watch the American P-51s buzz the prisoners at Regensburg hour after hour on April 6 and fellow prisoner Alex Stauffenberg’s wife crash land her plane practically in the backyard of the schoolhouse where the prisoners were staying the day Bonhoeffer was picked up for Flossenbürg. As for the backstory, I hope there are unmistakable echoes of [Bonhoeffer’s books] Discipleship and Life Together. What made you want to make the movie in the first place? How long have you been working on it? Martin Doblmeier inspired me, and my wife encouraged me. Doblmeier’s film about Bonhoeffer a dozen years ago hit the bull’s eye for accuracy and ignited tremendous interest in public showings. Ten thousand students saw it over a week or so at the University of Minnesota. I began ruminating about an angle and shared my fantasy with Ferdinand Schlingesiepen, dean of the European Bonhoeffer scholars. Our brief conversation ended with him bellowing, “You’re right, Gary, those characters Bonhoeffer ended up with would make quite a story!” Or something like that. One such character was Dr. Waldamer Hoven, Buchenwald Camp medical officer, who got himself thrown into the dungeon where Bonhoeffer and other prisoners lived. While practicing, he was known to finish his euthanasia rounds (IV phenol) and stride out of the building whistling When You Come to the End of a Perfect Day. You are the movie's producer — were you also intimately involved in the making of the film (writing, casting, editing, etc.)? As the producer, my main role was to divert the invoices to my wife, Lee. I also did a little writing and shaping of the story. Actually, I was intimately involved but not in the technical details. How did you choose Kevin Ekvall to direct the film? My friend Carl Wilkens recommended Kevin. They were finishing up I’m Not Leaving (a riveting telling of a story about duty amidst mayhem — a documentary about the ADRA worker who refused to leave Rwanda during the 1994 genocide), and Kevin signed on, agreeing to accept 10 Bonhoeffer books to be read in the next 10 days. The story that I found him sitting under a palm tree at the Loma Linda Hill Church bearing a sign reading “Will work for food — vegan preferred” is apocryphal. Who are the actors in the film? In order to swell the ranks of our Inland Empire actors with speaking parts (Scotty Ray and Kelly Reed), Kevin initiated several Hollywood casting calls. Two or three of our choices were fairly fresh off the boat from the UK. One of these guest workers is a recently retired Lt. Colonel from the Royal Marines. The first day of filming, he came roaring up on a Harley, dressed in the skins of animals. The actors, including extras, ranged in age from three years to late 80s. Eventually, there were over 150 people involved. I believe Come Before Winter was filmed in locations in Germany and around Europe. Were you on set? How was the film funded? The first interview was filmed in my old stomping ground, Santa Fe, New Mexico. I missed the most compelling site, the German island of Rügen, where Bonhoeffer and Moltke debated for hours the propriety of killing the head of state. I was present on the death march at Buchenwald when our German partner, writer, and supervising producer, Hellmut Schlingensiepen, could not bring himself to breach the posted warning to visitors not to remove anything. The rest of our crew (Americans) shouldered a 20-foot steel pipe arriving a half hour later at our destination: the special prisoners’ cellar on the edge of the camp. Our cinematographer, the 95-pound Tanya Musgrave, did not flinch. She and Kevin had agreed they needed this heavy pole for a couple of shots. On the funding question, we stop well short of the amount for The Recordkeeper. I understand the film was shown recently to great acclaim at the Bonhoeffer Society. What feedback did you receive? How will the film be distributed? How will people be able to watch it? I hope the film will get around to churches and schools. We will also try to find a way to have real Bonhoeffer experts lead discussions in person. Otherwise, discussions might default to me. We’re working with a couple of marketing experts on normal distribution channels such as selling DVDs and streaming on Amazon and through our website. I would also like to find a way to just listen to a few parts the story starting with FDR’s astonishing five-minute prayer broadcast across the land on the night of D-Day. Don’t miss a snippet of that in the first few seconds of the film. The listening experience would end with Ariel Quintana’s beautiful composition, our theme music, mixed by a celebrated technician in Hollywood. What wisdom do you feel Bonhoeffer can still offer people more than 70 years after his death? What is the main message you hope that viewers of the film will take home? The world stage always seems crowded with evil, vengeance, and greed, and as individuals, we often react in extremes or not at all. For example FDR’s Secretary of the Treasury, Henry Morgenthau, Jr., wanted to convert Germany after the war to a giant potato patch. At the other end of the spectrum, Pastor Martin Niemöller, highly regarded opponent of National Socialism, proposed taking all of the Nazi war criminals out — and forgiving them. Punish them not at all. My premise is that Bonhoeffer was part of a movement, the German resistance, made up mainly of Christians, and not nominal ones, who stepped knowingly into the treacherous world of “regime change,” which involved overriding their mores and sometimes their consciences. Dietrich Bonhoeffer was a gentle soul who demands now as much as ever to be taken seriously. That said, I’m fairly sure he would caution us about inflating our individual value. I think one of Bonhoeffer’s most coveted assets for the resistance was his ecumenical contacts. Do you have the bug now? What other movie ideas do you have? This is a delicate matter. I’ve floated an idea with a couple of people. Remarkably, both of them suggested I check in for an extended stay at the Gland Sanitarium outside Geneva. Should that happen and while I am away, if a film is released called Dead Man in the Dock: The Trial of General Remer, I’d appreciate learning of it. Gary Blount, a long-time Spectrum supporter, works as a psychiatrist in Minnesota, where he lives with his wife Lee. 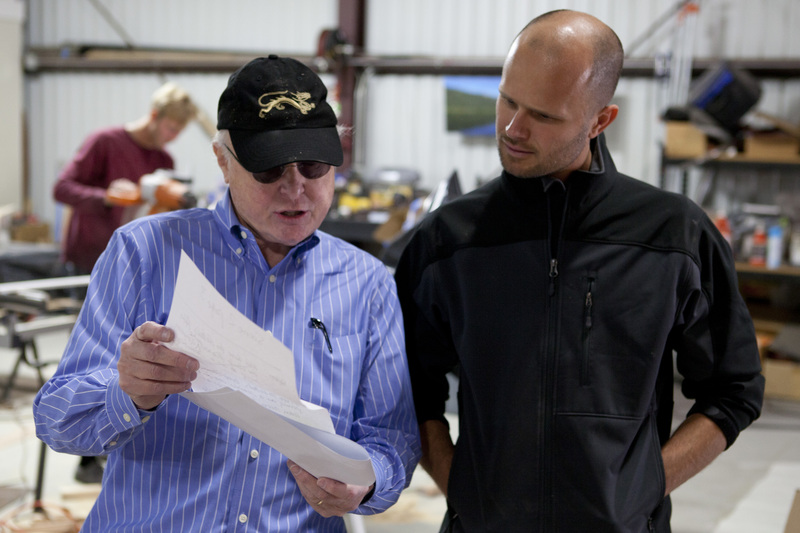 Top photo: Gary Blount, left, with director Kevin Ekvall on site in an airplane hanger. See a list of numerous Spectrum articles about Bonhoeffer here.